The dramatic city landscape of Qingdao provided the backdrop for Day 1 of the Extreme Sailing Series™ Qingdao, Act 2 of the 2011 global tour. Qingdao hosted the Olympic sailing events of the 2008 Beijing Games in addition to being a stopover port for both the Volvo Ocean Race and the Clipper Race but the people of Qingdao haven’t seen anything like the Extreme 40s before and although these first two days are non-public days, hundreds of public gathered along the huge pedestrian breakwater to see first-hand the boats in race mode. Six races were staged today on the outside of the breakwater in a good easterly breeze between 10-15 knots and the ‘open water’ courses, still close enough for the spectators to follow each race unfold. 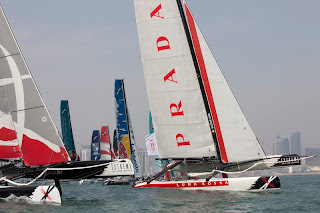 The gloves were off from the beginning and it was clear the 11 teams were going to push for every inch of water, resulting in two minor crashes which saw Groupe Edmond de Rothschild collide with Alinghi and Red Bull Extreme Sailing barrel into the back of team Niceforyou’s port hull. 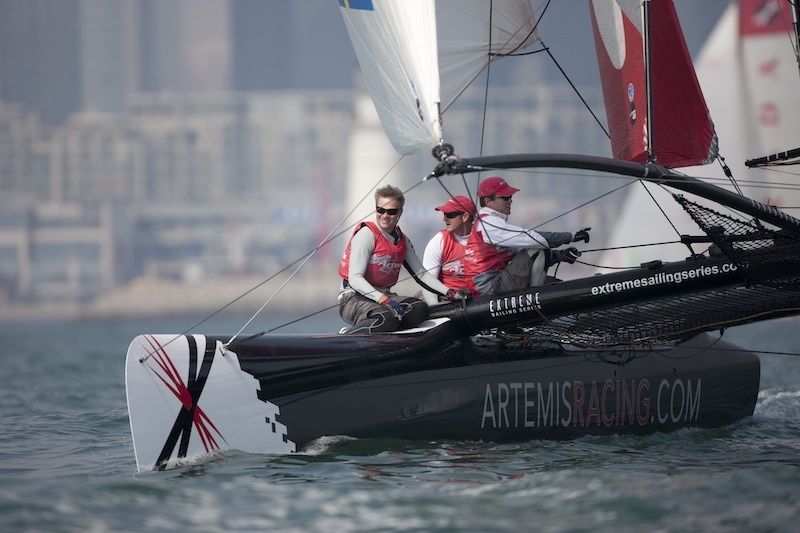 It was Dean Barker’s Emirates Team New Zealand who had the better day finishing at the top of the leaderboard on 49 points: “We started off a little bit slowly and then we steadily improved, our worst result was a 7th. It was testing today as we haven’t had the ideal preparation and I’ve been a little bit crook with food poisoning but it was good to get out there. The racing is really tight but it is the reason we are here, we want to test ourselves as much as we can against the best multihull sailors in the world, and this is the place to be.” The Kiwi campaign is gathering momentum from their impressive start in Act 1 in Oman, which saw Barker’s men find their form over the final two days to finish 4th overall. And today’s 1st, 2nd, two 4th places, 5th and 7th place demonstrated that they are steadily on the upward curve. The Swiss-team Alinghi skippered by Tanguy Cariou, helmed by Frenchman Yann Guichard, had a good and a bad day… Two 1st places in race 3 and 5, but three results in the bottom half left them in 5th place overall after the first day. Max Sirena’s Luna Rossa improved in the second half finding some consistency to leave them in 6th place, a good 8 points ahead of Act 1 victors, Groupe Edmond de Rothschild, two second-places being their best race results of the day. Chinese sailor, William Wu, on board Roland Gaebler’s Team Extreme had his first Extreme 40 race experience. Having had little time to train together, Gaebler’s team will be looking to improve on their current 10th place standing as Act 2 unfolds. Check out Seb Destremau’s chat with William Wu here. Tonight the 11 teams will be attending the ‘Official Opening Ceremony’ at the Shangri-La Hotel attended by Qingdao’s city dignitaries and the Qingdao organising committee. View the Qingdao promotional video here.